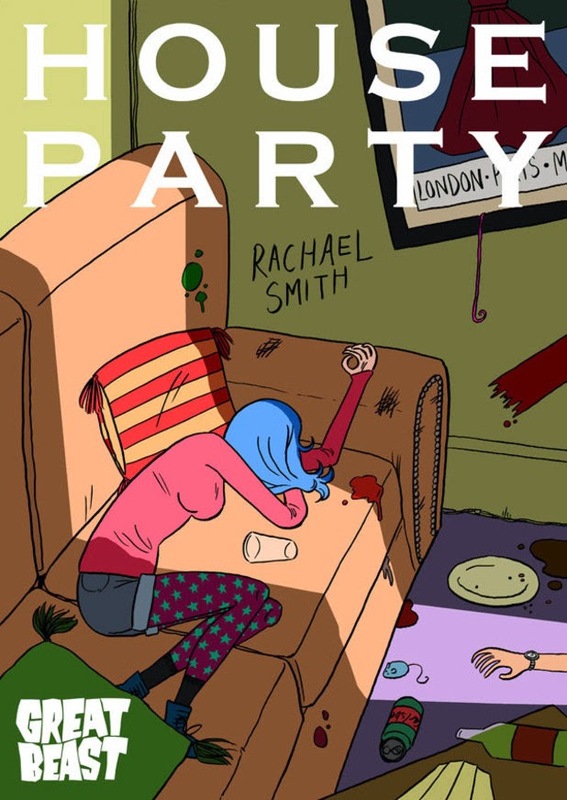 In Rachael Smith's big-publisher debut, House Party, she channels early twenty-something angst into a breezy and lively story about three friends from college who miss their glory days. In college, Neil was a successful comedian, his girlfriend Michelle an award-winning writer and their roommate Siobhan an artist. The punchline for anyone not in their early twenties is that all three of them are working menial jobs that have nothing to do with their art and feel like they've either sold out or are over the hill--but they're only two years out of college! While that seems like a ridiculous notion on the face of it, that a 24 year old should feel washed up, Smith gets at the heart at why this sort of thing happens. Without the natural support of college and its insulation against the real world, it can feel difficult to achieve the same kind of productivity and success that one experienced with the structure of classes, teachers, institutions and friends. 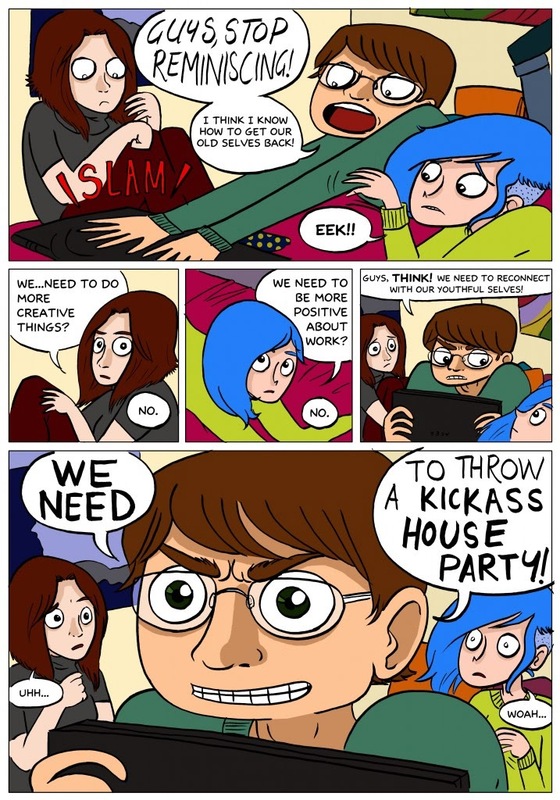 Just as important is that the community one built in college is effectively ripped away once friends start to leave town, get married, and start careers. The urge to keep that circle of friends just as it was in college, to repeat the same kind of epic parties and to hope that doing so will maintain one's creativity is at the heart of this book. After a particularly dispiriting day for all three, Neil decides that the antidote to their ennui is staging a house party like they had had a couple of years prior. That event was a high point for all three, especially since it kicked up the romance between Michelle and Neil to another level. The flagging romantic relationship just two years later began the book as a subplot, but it takes on greater prominence toward the end. Naturally, trying to recreate the past has dire consequences, especially when they invite over a band (the perfectly-named The Helveticas) that initially idolized Michelle and then later shunned her out of jealousy. That was especially true of striking redhead Georgia, the lead singer of the band. While the trio manages to convince the band to come over to their place for the party (saving it from the doldrums), it comes at a heavy, heavy price. The young guests act like animals and Georgia has eyes for a drunken Neil. In the end, all three learn that while it's impossible to reconjure the circumstances that led to such remarkable camaraderie and creativity, it is possible and in fact necessary to create new paths and new methods in order to move forward. Sometimes those paths come with hurt feelings and broken relationships, but Smith seems to argue that inertia is a far worse fate. 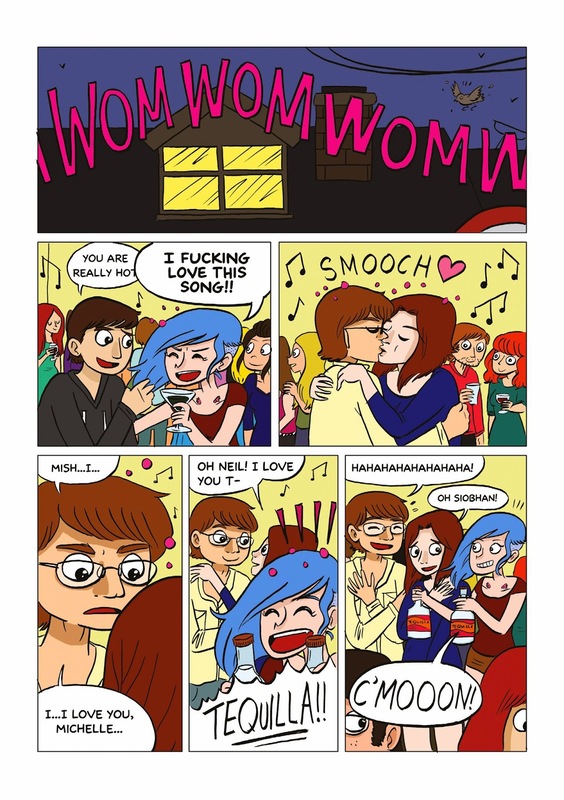 This book is heavily influenced by Bryan Lee O'Malley's Scott Pilgrim series. That's especially true with regard to the character designs and overall figurework, though Smith tamps down some of the more manga-inflected aspects of his work. Georgia looks and acts a lot like Envy Adams. Smith and O'Malley cover a lot of the same early 20s aimlessness, selfishness and angst. Rock music plays a big part for both as a general part of youth culture. However, Smith avoids the magical realist aspects of O'Malley's work and instead focuses on a powerful form of alienation that results when one graduates from college. Visually, her use of color is what really distinguishes her work from O'Malley's; it's bold, bright and expressive without overwhelming her solid linework. And while Smith's story is similarly about twentysomething alienation and disaffection, much like O'Malley, her version of this is far more compact. To be sure, this book represents a big step forward for Smith, who managed to retain the quirkiness of earlier works while shedding some of their more self-indulgent aspects.